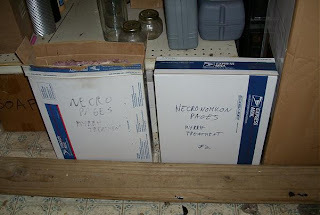 I happened to be cranking out a new batch of Necronomicon pages a couple of months ago, and so I thought I would snap a few pics of the process, for those who might be interested. The process of creating the page begins with drawing the artwork. For the pieces that I create myself, I begin by hand drawing the design on blank copy paper. I use black gel pens because they write very smooth, cover very well, don't bleed, and create a uniform color even when filling in larger areas. I used to use Sharpie pens, but I found that over time, the ink from a sharpie will leach out into the paper, giving it a yellowish halo. Then I scan the artwork into the computer and do any necessary touch-up with Paint Shop Pro. I also glean public domain images off of the web, and I have permission to use certain images by ZARONO, which he sent me on a disk. After making any alterations to the images in Paint Shop Pro, I lay out the page using Corel Draw. This allows me to size and position text and images any way I want. Finally, I save the page as a PDF (for transportability), and print out a copy on my printer's highest quality setting. That becomes my copy master. Then it's off to a high quality photocopier for mass production. Once I have a stack of copies, I clamp them together and rough up the edges with a Dremel tool and a router bit. 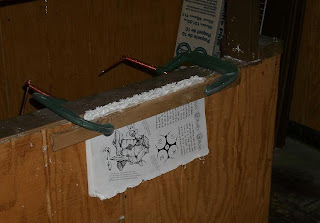 Here I have the pages clamped to the edge of my railing surrounding the basement trapdoor. I used piece of 1x2 and a couple of C clamps. The edge of the paper sticks up above the railing about 1/2 of an inch. Then I just go to town carving up the edge with the router bit. I hate this part of the process because it covers me and everything in the room with a fine white powder of sawdust. 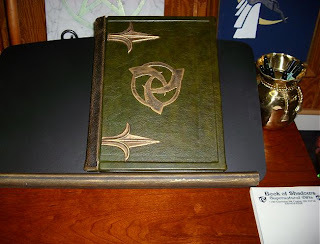 I have tried several techniques for clamping the pages together while Dremeling them. This one worked pretty well. Once all four sides are carved up, It's off to the staining bath. Here is my worktable where I stain the pages. I hate this part too, because it's messy, and it stinks. It wouldn't have to stink, but I'm too cheap to make fresh coffee each time. I recycle it. Some times I use it over and over, just adding to it as needed. It gets pretty rancid after six months or so. I use a combination of stains, including black tea, instant coffee, and this time around I added a little RIT brown fabric dye. I have mixed feelings about the fabric dye. It turned this batch a reddish brown color. I'm used to a nice tan brown from the coffee-tea mix. Some of the pages that got less of the dye only turned reddish on the edges and look quite striking, but some came out too red all the way through and I'm not sure I like them as well. All in all, far from my worst batch. I leave the pages to soak in the bath for about 15 minutes. I also use hot water as much as possible, to ensure the fibers of the paper blow open and take up the stain. The quality of the paper has a great impact on this part of the process, and varies widely from one brand of paper to the next. The brightness, weight, and the amount of sizing on the paper all dictate how well it will take up the stain, and how long it will need to be left in the bath. 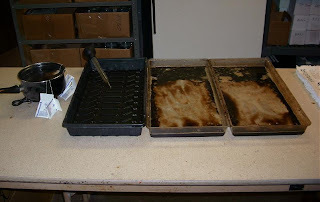 After the pages come out of the bath, I drain off the excess water, and stack them in another bath tray. Then I tilt up the tray and let the whole stack drain some more, until most of the excess water is out of it. Then I split the stack into manageable chunks, being very careful because the wet pages are very delicate.In the summer months, I like to take them outside and lay them in the yard to dry in the sun. This dries them very quickly, but created other problems. First, they tend to blow away in the wind once they dry. Second, because I use tea in my stain mixture, the tanic acid reacts with UV light. Any pages that have exposure to direct sunlight will get very dark. This can be good, as I sometimes like the pages to be a little darker, especially if they didn't take up enough stain. However, You have to watch them very carefully as the reaction happens kind of fast and without warning. You also have to make sure each page gets direct sunlight, as only the top page (getting direct sunlight) will darken. It also only darkens on the exposed side, so you have to flip them for even coverage. 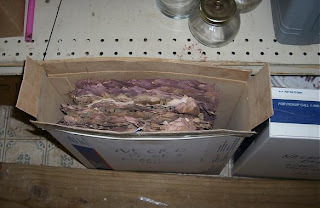 In the winter, I clip them to a hanging rack with clothes pins, keeping them in bunches of 8-10 pages. 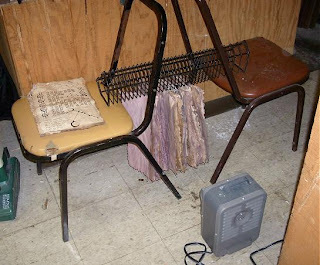 Then I sit the rack over the heat vent, or in front of a space heater with a fan. This method takes much longer than drying in the sun, so I usually do it overnight. After they are dry, they get put into a box with granulated myrrh. Then I shake them vigorously, over and over again, for several days, for up to a week. This pulls more moisture out and gets rid of the rancid coffee smell. Then I randomly burn some of the edges. I don't burn every page I just grab a hand full at random, and I do it in smallish stacks, so they are not all burned in the same place. About half of them get burns. I try to keep the burning to just the edges, so as not to obscure the text and images too much. I have burnt myself more than once trying to put them out. The last step in production is the application of blood stains. I use Dragon's blood ink, sometimes mixed with a little sepia ink to darken it, and a small disposable eye-dropper. The eye-dropper gives me realistic drips and arterial spurts. Sometimes I drip the ink on, and then tilt the page and let it run, giving me a nice dripping effect. Then they have to dry. The last step is sorting. I have to sort out all the pages by design, then group them into the bundles for sale. This takes a little time, and a lot of floor space. That's it. They are ready to go! I like the movie, "The Ninth Gate", with Johnny Depp and Frank Langella. I like the simple and sedate, yet obviously malevolent, look of the book featured in it. 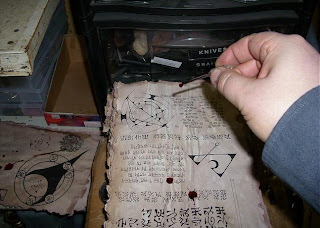 This, of course, looks nothing like the book from the movie, but the reversed pentagram on the cover reminds me of it. This is my latest in the "encyclopedia conversion" series of prop books. 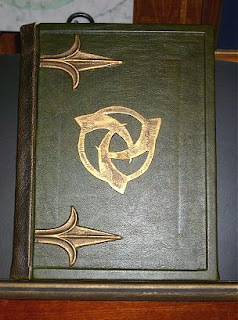 It features a mottled dark green vinyl cover, with embossed reptile skin pattern. The corner embellishments and the central pentagram are cast resin with an antique bronze finish. The spine plaque is chip board with raised glyphs made from hot glue. It is finished with acrylic paint and gold rub-n-buff. 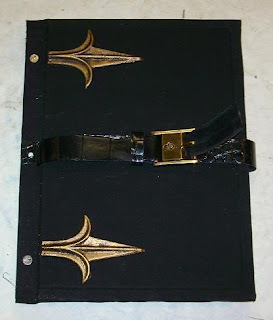 The most unique thing about this piece (compared to similar tomes I have done in this series) is the locking mechanism. I used a solid brass security chain (like you would have on your front door) and cut it to length. I had to do some reshaping of the mounting plaque with the dremel and a hammer. Then I had to do some soldering, because I didn't realize that brass is easily work hardened and will crack if you try to un-bend it without annealing it first. The four rivet heads on the mounting plaque are brass nail heads that were cut off and super glued in place. I used the end which gets slid into the slot (and which got cut off when I shortened the chain) as the other half of the clasp to be mounted to the front cover of the book. It had a brass loop that was the perfect size to accommodate the little brass lock. I cut a recess hole in the front cover and glued the brass piece firmly in place. A the moment I'm sick again, so I haven't been working on anything in the past few days. However, just before I got sick, again, I was working on those blank 3 hole punched journals modeled after the Public BoS I just finished. They are not done yet, but I have a few pics of them to illustrate the construction process. 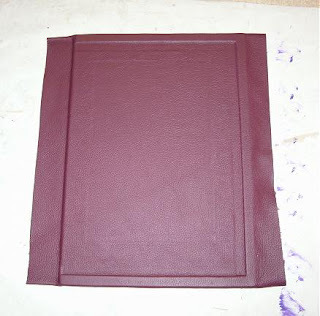 Here is one of the heavy hardboard covers that has been wrapped in a raspberry colored leather. You can see the chipboard edging around three sides poking up from underneath the leather. 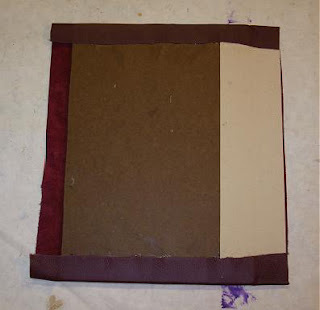 The flap of leather on the right side will be tucked around the edge and glued, just like on the top and bottom edges. The flap of leather on the left edge will be where the holes are punched. That edge has a piece of card stock glued to the underside for added stiffness and manageability. You can see it in the picture below. The card stock is on the opposite side in this pic. Two of these assemblies will form the front and back covers. The three hole punched pages will be sandwiched between them and the whole thing held together with three post screws. Then a leather strip with turned edges will be added as a spine to cover the screw heads. This will be attached with a weak glue so that it can be removed to add pages later. Ohio is not really a hot bed of pagan activity. There are only maybe a dozen (physical) pagan shops in the whole state. Many of the owners know each other from various functions, festivals and meet-n-greets. A few weeks ago, my clerk at my shop visited our closest competition (about 30 miles away, in Akron) just to have a look around. My clerk and I have both met the owner numerous times, she is very nice, but neither of us had ever made it up to her shop to check it out, so she made the trip to get a feel for her shop and to see what kinds of things she carried and of course to compare notes on decoration and presentation. 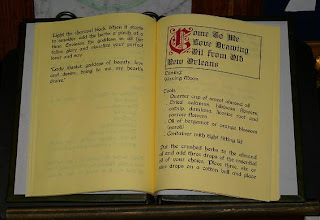 One of the things that her shop did, that mine did not, was to have a public Book of Shadows for customers to peruse. Just a collection of a few simple spells, kept in plastic sleeves in a three ring binder and set on a dictionary stand. People would use it as an easy reference guide. She said that having it had helped increase her sales of some of the components listed on its pages. I thought the idea was a very good one, but I didn't much care for the way it was executed. I decided to do something similar, but with more style. Toni (my clerk) set about researching a few dozen simple spells to be included in the book, while I set about the physical construction of the project. I had a flat pack two drawer wooden file cabinet, very nicely made, that I had been sitting on for over a year. 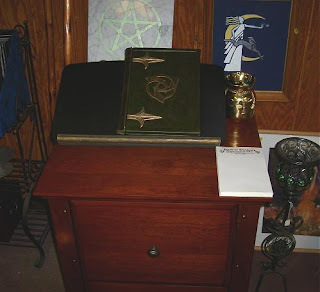 I had intended to make some modifications to it (a la the Pentagram Altar Table), but had never gotten around to it. I decided that it would be perfect for the stand for our public BoS. I was actually quite impressed with the quality of the piece once it was put together. It was made by O'Sullivan. Sadly, that company seems to be out of business. That's a real shame, because this cabinet, and another table I have from them in my house, are two of the nicest pieces of flat pack furniture I have ever seen. 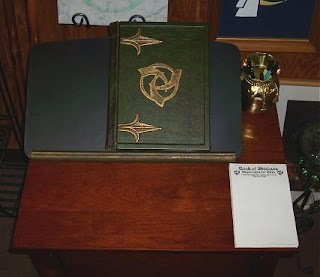 I also happened to have a simple book stand/lectern top that I scavenged from the trash at my former job at the oil refinery. It was made from melamine laminated particle board, and it was badly swelled on the one edge. I soaked the edge in wood glue and put it in some aggressive clamps overnight and that helped with the swelling significantly. I gave it a few quick coats of flat black paint and a little gold rub-n-buff on the bottom edge and it looked good as new. I scrounged up a nice brass pot to use as a pen holder and I printed up a stack of 5x8 sheets of scratch paper with the store's name and address on the top, which I then rubber cemented into a neat little notepad. These would also be seated on top of the wooden cabinet, so that customers could jot down notes about the spells they wanted to do, and create their shopping lists for their needed components. All that was left to make was the book itself. I wanted something that could use three hole punched pages, but that wouldn't look like a three ring binder. I also wanted to be able to insert or rearrange pages after it was made. I decided to use "Chicago" style screw posts and to make a pair of nice front and back covers from wood and leather. After about a day's worth of visualizing my design. I started fabricating. The covers were made from two pieces of hardboard, cut to size, then with some chipboard trim added around three edges. Then I covered the boards with some nice dark green leather. 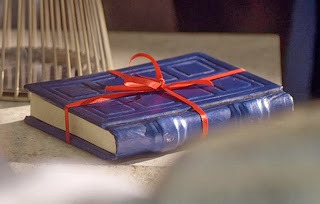 A flap of leather, stiffened with card stock, was left on the spine edge. This is where the three hole punches would pierce the cover. Grey end papers finished off the inside surface. I needed the post screws to go through the covers to hold them on, but I didn't want them to be seen, so I made a spine out of brown leather to wrap around the spine edge and cover the post screw heads. This I glued on with rubber cement, so that it could be easily removed to add pages. For the final embellishments, I added some cast resin finials and a chipboard representation of the store's logo, finished with black paint and rub-n-buff. 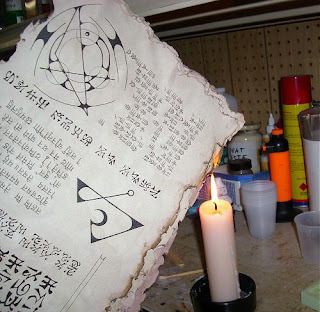 Toni is still in the process of putting together the spells for the interior, but the few sections she did send me, I laid out in a nice font with Open Office and printed on a pale yellow paper (though I would have preferred a cream color). Because I'm sure we will have several people ask if they can buy the book right off of the stand, I am making a few others (but blank) of the same design. While I may not have been posting much lately, I haven't been (completely) idle. I did slow down there for about a week or two, due to being ill, but I'm back on track now and I have a few new projects under way. 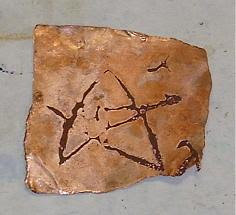 Ever since I found Jake Von Slatt's article on DIY galvanic metal etching, I have been fascinated with the results. But, much like using photo-emulsion for screen printing, I hesitated to try it because it looked difficult. Finally, I got up the courage to give it a try. This is very much an experiment in progress, so I don't have a lot to report just yet. At least nothing terribly exciting, but I will post updates as the experiment progresses. It took me several days and several trips to multiple stores to find the copper sulfate. Neither Wal-Mart, not Lowes or Home Depot (at least not my local ones) carry the Root Kill mentioned in Von Slatt's article. 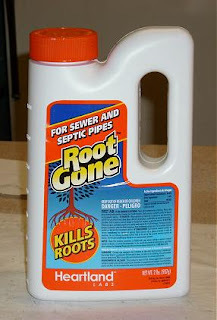 Finally, I found another brand, called Root Gone at a new Menards that opened in Massillon recently. Shortly after, I read Von Slatt's follow up article which told me that I could have gotten away with using salt water instead. Live and learn. Well, now that I have the stuff, I plan to give it a go anyway. I started off by experimenting with the photo copy transfer technique mentioned in his article, but I had very little success. Of course I wasn't following the instructions exactly, because I didn't have the proper equipment (i.e. a laser printer). I tried using a plain paper photo copy, because I had one lying around, but it didn't work very well. When I get around to going out to Kinkos, I will try it again using the photo paper that was prescribed in the article. A new blogger, Mr. Able, has promised to post a tutorial on his etching method (which appears to work spectacularly) over on the Brass Goggles Forum. Maybe I'll just wait for that. I decided to ditch the photo transfer resist idea (for now), and just do something simple, like using tape or contact paper as a mask. That would at least allow me to experiment with the etching process a little. I could perfect the masking process later. 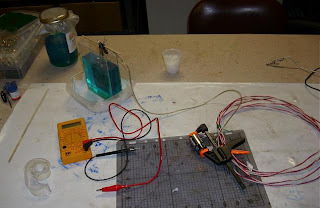 I mixed up my copper sulfate solution and brought in my 10amp car battery charger. I didn't use a battery for a buffer (though I probably should), because I didn't have one handy, and because I didn't think it would be necessary as long as I was careful. 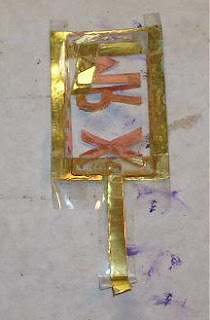 For both the cathode and anode, I used a piece of 36 gauge copper art foil approx. 3 inches square. Following (somewhat) the Galv-On method described on the Greenart web page, I placed the piece to be etched on the bottom of a disposable Gladware-type sandwich container, then laid a piece of felt on top of it to prevent contact with the anode. 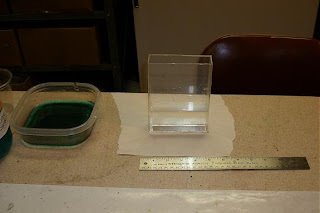 On top of that, I placed the anode plate, and filled the container with the copper sulfate solution to just cover the plates. I switched on the juice, and watched. The amp meter on the charger was reading a steady 10 amps, which I thought was good. The breakers didn't pop, which I thought was even better. It didn't take long (a minute or two) to start noticing some action in the container. The anode and felt prevented me from seeing what was happening with the etching plate, but I could see some bubbles and some black waste product seemed to be forming in the solution. I stared getting nervous that the felt was melting (it was cheap synthetic craft felt, not wool), so I shut it down and removed the felt and examined the plates. There was some copper residue on the felt, but I didn't see much etching on the plate. I replaced the felt with some folded up paper towel (at least it won't melt, I thought) and returned the plates to the container for another go. I had no idea how long this process should take, so I left it in for about 15 minutes, then checked it. The results were disappointing. While I could see there was some galvanic action going on, I couldn't see much etching (at least not controlled etching). There was definitely something happening to the plates,but it was hard to tell exactly what. Only the edges of the plate looked like they showed significant thinning. A second attempt was made using a different piece of copper foil for the etch plate, and a different material for the mask (masking tape). The results were largely the same. On the third attempt, I used enamel model paint as the mask. Something happened on that third attempt that I can not explain. The rig was set up exactly the same as before, but this time the charger spiked up to 50 amps. The solution boiled rather quickly. I kept turning it on and off, and trying to adjust the plates, thinking that I was shorting something out, but it kept bouncing up to 50 amps. I wasn't doing anything different than I did on previous attempts. I could not explain it. Anyway, I kept it going for a short time (about 15 minutes) and then turned it off to check on the plates. The etching plate had been almost completely dissolved! Though on the small scrap that remained, there were a few spots that were raised, where the mask had been (the paint was now entirely gone), so that was somewhat encouraging. 50 amps for 15 minuted was clearly far too much. But my current rig would not allow me to see what was happening to the plates, nor did it give me much control over their spacing. I knew I needed to make another rig, closer to the tank style that Von Slatt used. I set the etching aside for the moment and set about building a new rig. I cut several pieces of clear thin Plexiglass with the Dremel. Normally I use a rigid cut off wheel for this, but this time I opted to use a flexible sanding disk. I didn't think the sanding disk was quite thick enough to hold up to cutting, so I backed it up with a piece of card stock cut to the same diameter. I was actually surprised at how well this cut the plexi. Both the way the pieces were cut, and the way they were glued were both experimental (for me). I had recently purchased a special glue made specifically for gluing acrylic. I used a medical syringe as an applicator (my mother is diabetic) and it worked amazingly well. I ended up making a plexi tank about 2 inches wide by 4 inches long by 6 inches deep. Here you can see me leak testing it with some water. No leaks, on the first try! Time to put the new tank rig into service. This time I switched to a brass foil (also 36 gauge), and used vinyl contact paper as the mask. I removed the car charger and replaced it with a single C cell alkaline battery. With only 1.5 volts and a tiny fraction of the amperage, I wasn't sure if the battery even had enough push to make any effect at all. To increase the conductivity of the solution, I added a little sea salt to the mix (though I'm sure it wasn't necessary). I figured it couldn't hurt. It was late, and I was tired, so I hooked it up to the battery and left it over night. When I came back (14 hours later), the results were similar to experiment #3. Most of the metal that wasn't protected by the mask was completely eaten away. However, the mask did remain in place, and the metal under it was only minimally affected. On the plus side, the low voltage allowed the released copper to properly attach to the anode plate. 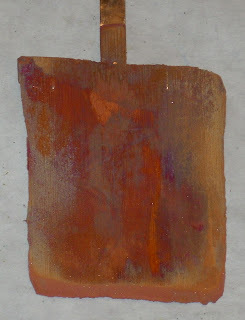 While the earlier experiments produced copper buildup on the anode, it washed right off. This time it was well and truly electroplated. Interestingly, something about the electroplating process caused thin parallel ridge lines to be formed in the copper plating. They were very uniform and ran vertically (from the top of the tank to the bottom of the tank) along the entire front surface (facing the cathode) of the anode plate. No such lines existed on the original foil plate. I have no explanation for the phenomenon. Click on the pic for a close up of the lines. 36 gague foil is a little too thin for this process. 50 amps at 12 volts for 15 minutes is too much. X amps (probably less than 1 amp) at 1.5 volts for 14 hours is too much. 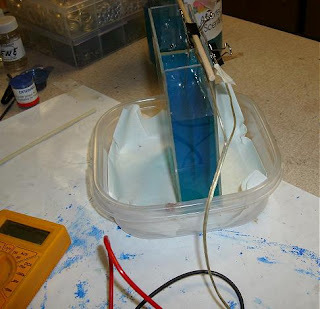 Lower voltage allows for adhesion of the copper buildup on the anode.